Animals provided much more than meat. Archaic Period people made use of many parts of animals, but only the hard parts are usually preserved at archaeological sites. They used skins and hides to make clothing, bags, and coverings for structures. They probably used sinew (tendons and ligaments) to make cordage. Feathers were used to adorn clothing and objects. They used bones and shells to make tools, ornaments, and special objects. Archaeologists recovered fragments of decorated cane spear shafts in lower Salts Cave in Kentucky. They likely date to the period immediately following the Late Archaic. Image taken from Patty Jo Watson, 1969, The Prehistory of Salts Cave, Kentucky, Illinois State Museum Reports of Investigations, No. 16. We know that Archaic Period people would have used wood and other plant materials to make a wide variety of tools. Some cave sites have extraordinary preservation. For example, archaeological remains from Mammoth Cave and Salts Cave in Kentucky provide some evidence for tools, including torches and mining tools. However, these tools largely date to the Early Woodland Period. This Period occurs after the Late Archaic Period. There are also many historic records of tools made from perishable materials. Some of these types of tools are still used today. A series of rock shelters in northwestern Arkansas and southern Missouri called the “dry shelters” contain archaeological assemblages with outstanding preservation of organic remains. Many of the remains were excavated in the 1920s and are poorly recorded and dated. The shelters include some remains from the Archaic Period, but later remains from Woodland, and Mississippian occupations predominate. Although many of the remains likely postdate the Archaic Period, the shelters provide a glimpse of the use of wood and other perishable materials for tools. Archaic Period Indians made numerous kinds of tools from durable animal bones and shells, as well as stone. We recover bone and shell tools at numerous Archaic Period sites including open sites. 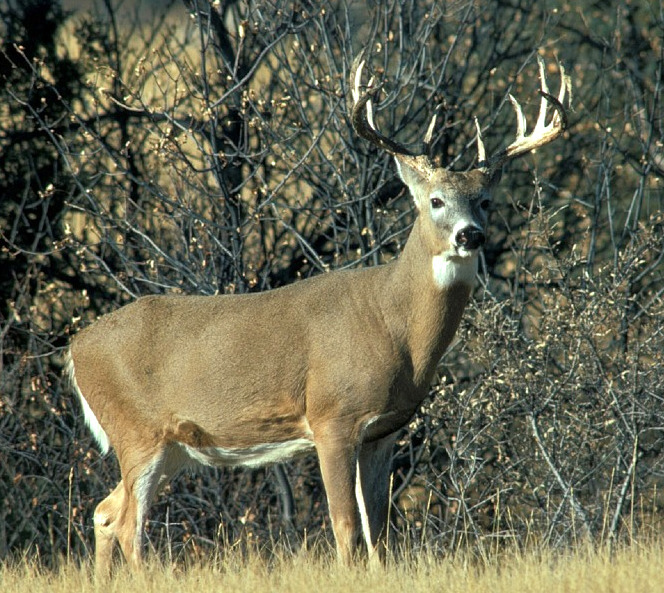 Archaic Period Indians relied on the white-tailed deer as an important source of meat and raw material for tools, ornaments, and clothing. Image taken from Pixabay CCO Creative Commons. Archaic Period Indians in our study area would have made use of virtually every part of the deer including meat, organs, bones, antlers, sinew and tendons, and hides. These raw materials would have been made into tools, ornaments, clothing, and skin bags and coverings. At open sites, we primarily find items made from durable bones and antler. The deer likely also assumed spiritual importance, but that will be covered later. Archaic Period people at Modoc Rock Shelter, Koster, and many other sites often modified and used deer antler for tools. They removed antler tines using the score-and-snap (also called cut-and-snap technique). They cut antler tines part of the way around or cut through the hard outer layer and then snapped off the tines. They made tines into a variety of tools including spear points and awls or perforating tools. They used antler tine “flakers” to press small flakes off the edges of stone tools and larger sections of antler with broader blunt ends to flake stone tools. We call these tools billets. They also carved pieces of antler into hooks that were used with the spear thrower (atlatl). Hunters affixed the hook to the back part of the spear thrower to hold the spear shaft in place for the launch. 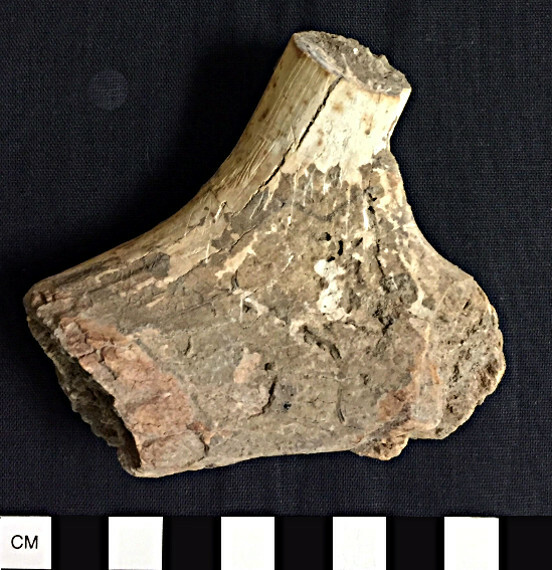 Archaeologist recovered an antler atl atl hook in the late Middle Archaic deposits at the Carrier Mills site in southern Illinois. Antler atlatl hooks are also found at other Archaic Period sites. 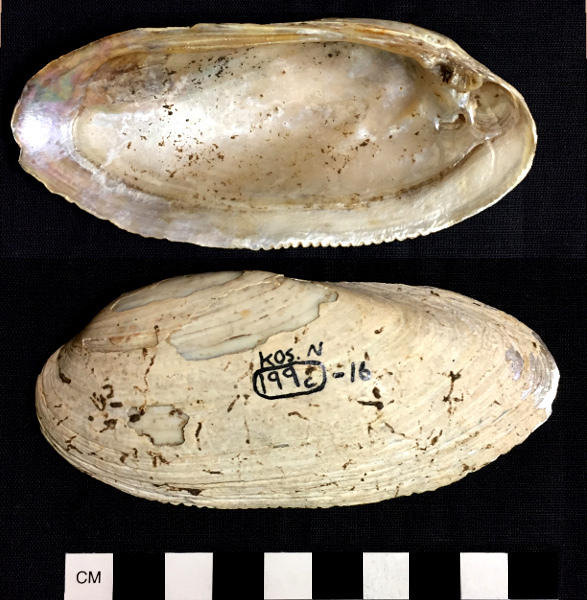 For example, they were also recovered in the Ohio River Drainage, including the Green River Shell Middens in our study area. A middle Middle Archaic Period Indian cut a large section of deer antler all away across and also removed a tine using the cut-and-snap technique (image on left). Archaeologists recovered this piece of antler in Modoc Main Shelter in 1953. The middle image shows early Middle Archaic antler projectile points recovered at the Modoc Main Shelter in 1984. The makers of these projectiles ground the tines to sharp points. You can see long striations from the grinding. During the late Middle Archaic, an individual may have used the artifact in the third image to press small flakes off a chipped stone artifact. We call this kind of tool a flaker. Archaeologists recovered it in the Modoc Main Shelter in 1953. Images taken by Bonnie Styles. Larger pieces of antler were used to make hide scraping tools (sometimes called gouges). Antler gouges are found at many Archaic Period sites. At the Late Archaic Robeson Hills site, near the Riverton site in the Wabash River valley in our study area, archaeologists recovered numerous antler gouges with a distinctive shape (see image on left below). They referred to this style of hide-working tool as Robeson Gouges. Dr. Howard Winters observed that similar-shaped gouges were recovered in shell middens along the Tennessee River and at a site Kentucky. He argued that this style of gouge may have been exchanged. However, archaeologists excavated a similar shaped gouge at the Napoleon Hollow site in the lower Illinois River valley in our study area (see image to right below). This gouge occurred in a late Middle Archaic feature so it is younger in age than the Robeson Gouges. This style of gouge may be more widespread and earlier in origin than originally suspected by Dr. Winters. We will continue to study the distribution of this type of gouge. 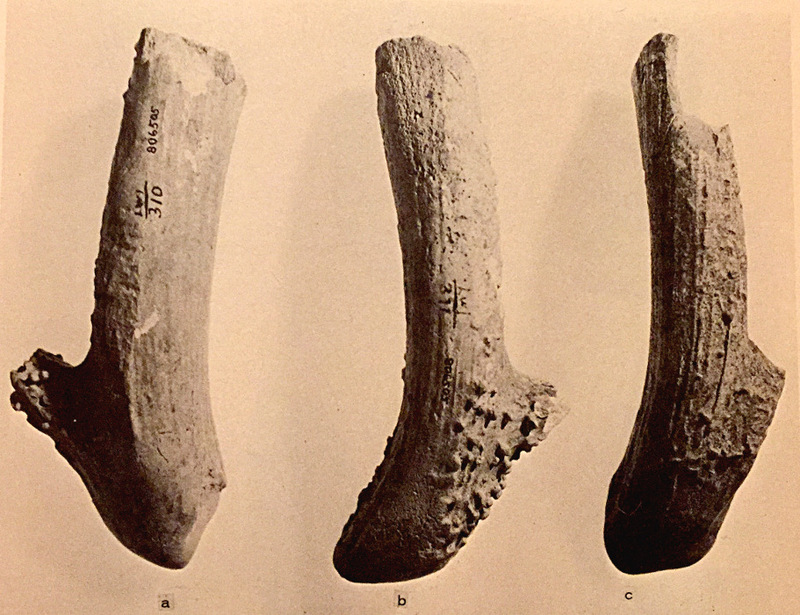 The three antler gouges (image to left above) were recovered from the Robeson Hills, near the Riverton site in the Wabash River valley. Late Archaic people at this site may have used these gouges to scrape and soften deer hides. Image taken from Howard D. Winters, 1969, The Riverton Culture, Illinois State Museum Reports of Investigations, No. 13. The gouge in the right image was recovered in a late Middle Archaic feature at the Napoleon Hollow site. Both sides of this gouge are shown. It probably served as a hide-working tool. Images taken by Bonnie Styles. A middle Middle Archaic Indian fashioned this piece of antler into a handle. Archaeologists recovered it in the Modoc Main Shelter in 1953. We included two views so you can see that one section of the antler has been shaped into rectangular flat surface. We think that a scraper may have been hafted to this surface. The composite tool may have served as a hide scraper. Images taken by Bonnie Styles. Archaic Period people also shaped antler into handles for other tools. 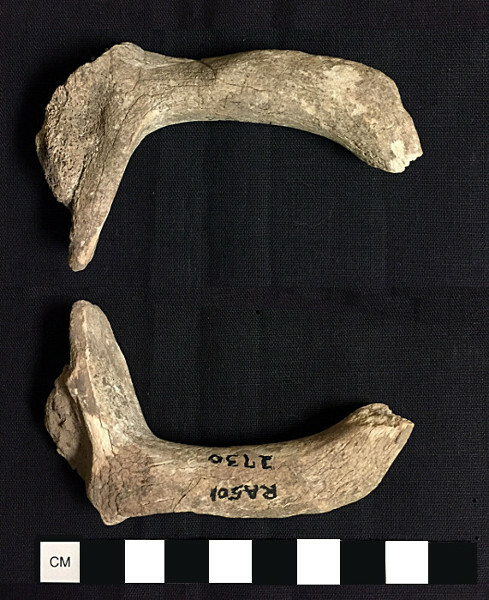 We puzzled over the function of the antler artifact from the 1953 excavations in the Main Shelter at Modoc (image to the left). The shaped flat surface suggests that the artifact may have been a handle. Perhaps Archaic Period people hafted a scraper to the flat surface and used the tools as a hidescraper. Archaeologists Thomas Pleger and James Stoltman illustrated two similar artifacts made from elk antler from the Reigh site, a Middle Archaic site in Winnebago County, Wisconsin. Both Modoc and Koster yielded smaller sections of antler that had been hollowed out and may have served as handles for awls or other tools. During the Archaic Period, tool makers shaped a wide variety of mammal and bird bones into pointed implements, sometimes called awls or perforators. These tools are common at Archaic Period sites. They may have been used to incise designs, make holes in skins and hides, skewer meat, and for many other functions. At Modoc and Koster, pointed implements were made from deer long bones and splinters of long bones, such as humeri, ulnae, metacarpals, femora, tibiae, and metatarsals. 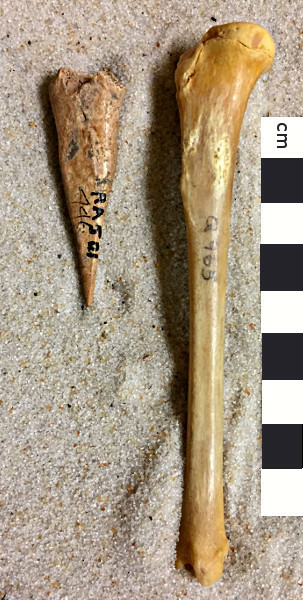 A late Early Archaic Indian made a pointed implement from a section of bone from a deer humerus to make an awl or perforator (image on left). This tool was recovered in the Modoc Main Shelter in 1953. A middle Middle Archaic Indian made a pointed implement from a splinter from a deer metatarsal (center image). Archaeologists also recovered this tool from the main shelter in 1953. If you click and enlarge the image you will see long striations on the body of the tool and polish on the tip. The pointed tip of this tool may have been used to engrave or pierce holes in objects. An early Middle Archaic Indian ground the distal end of a deer ulna to a blunt point perhaps to make a perforator to make or enlarge holes (image on right). Deer ulna awls or perforators are common tools in Archaic Period sites. The proximal end of the ulna made a natural handle for the tool. Archaeologists recovered this tool in a feature in the Modoc Main Shelter in 1984. Images taken by Bonnie Styles. Archaic period people also made pointed implements from bones of smaller mammals and large birds such as goose and turkey. They also made naturally hollow long bones from bird wings and legs into tubes. Sometimes these tubes had a point on one end. About 5,600 RCYBP, at the transition of middle to late Middle Archaic, someone fashioned a section from a raccoon tibia into a pointed implement to make an awl or perforator (image on left above). This tool was recovered in 1953 in the Modoc Main Shelter. During the Archaic Period, toolmakers also made awls from raccoon ulnae. An early Middle Archaic toolmaker modified the distal end of a turkey tarsometatarsus to make a pointed implement (center image above). We recovered this tool in the Modoc Main Shelter in 1984. Turkey tarsometatarsal awls and/or perforators are fairly common in Archaic Period sites. A late Middle Archaic toolmaker fashioned a goose ulna into a pointed implement (image on right above). If you click to enlarge the image, you will see that the tip appears polished and is burned to a blackish brown color. Archaeologists recovered this tool in the Modoc Main Shelter in 1953. Images taken by Bonnie Styles. Archaic Period people used the upper shells of box turtles (Terrapene sp.) and aquatic turtles to make bowls. They ground down the vertebra to make the interior surface smooth. They also made other containers from bones and shells. For example, archaeologists recovered a late Middle Archaic Period cup made from elk antler at the Black Earth site in southern Illinois. 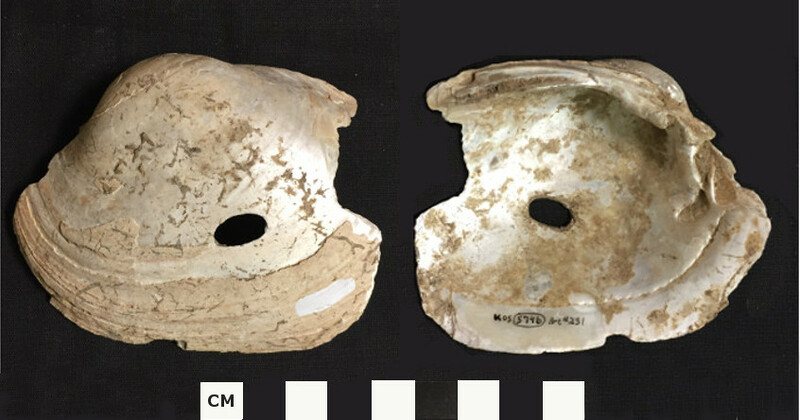 During the late Middle Archaic Period, an individual made a bowl from this carpace from an aquatic turtle (image on left above). Archaeologists recovered a fragment of the bowl from the Koster site. It was not identified to species, but compares favorably to a red-eared turtle (Trachemys scripta). The image on the right shows a painted turtle (Chrysemys picta) carapace from the comparative collection so that you can see how the interior of the archaeological specimen was modified. Images taken by Bonnie Styles. During the Archaic Period, freshwater mussel shells were likely used as spoons and scoops with little or no modification. Some shells were used as scrapers and some were drilled and likely hafted to a handle to serve as scrapers and digging tools. A late Middle Archaic Period person made fine notches along the ventral edge of a shell from a black sandshell mussel (Ligumia recta) recovered at the Koster site (image on left above). The shell may have been used to scrape an animal skin or plant materials. Click the image so you can see the fine serrations along the ventral margin and the use wear on the distal part of the ventral margin of the shell. During the late Middle Archaic period, a person at the Koster site drilled a hole in a plain pocketbook mussel (Lampsilis cardium) shell (image on right above). This shell may have been hafted to a handle and used as a digging tool. Images taken by Bonnie Styles.